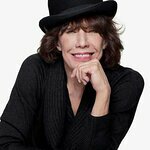 Emmy and Tony-winning, Academy Award-nominated actress and animal advocate Lily Tomlin (Grace and Frankie) joins actress June Diane Raphael (Grace and Frankie) and other comedic guests to bring the laughs to “Wait Wait…Don’t Kill Me!,” a night of unforgettable comedy and entertainment benefiting Voice For The Animals Foundation (VFTA) that will hilariously take on the year in animal news, views and other topical animal events. This ninth annual fundraiser, hosted by actor Paul Scheer (The League), will take place Saturday, May 6, 2017 at 8:00 p.m. at the famed Royce Hall on the UCLA Campus. All proceeds will support VFTA as they continue their fight for creating respect and empathy for animals through education, rescue, legislation and advocacy, including their work to free Billy the Elephant from the L.A. Zoo (#FreeBillyNow). 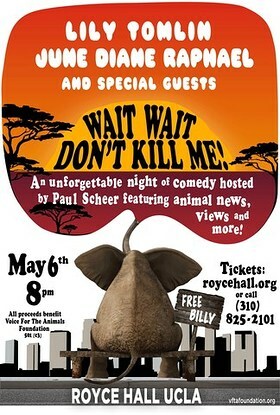 Said Melya Kaplan, Executive Director of VFTA, “Wait Wait…Don’t Kill Me!” will be a treasured night of hilarity to raise funds to help Voice For the Animals continue our fight for animal advocacy in a unique and engaging way. On behalf of the animals and all animal lovers, we are grateful to Lily Tomlin, June Diane Raphael, Paul Scheer and others for their live performances. We look forward to one of the most anticipated comedic events in Los Angeles." The evening will begin with a star-studded VIP (Vegan Important People) Reception and red carpet followed by the “Wait, Wait…Don’t Kill Me” comedy program. To purchase Tickets ($25-100), go to roycehall.org or Ticketmaster. For more information about the Voice For The Animals Foundation, please visit vftafoundation.org. To learn more about Billy the Elephant and to sign the petition to get Billy to a sanctuary, visit www.helpbilly-vfta.org.